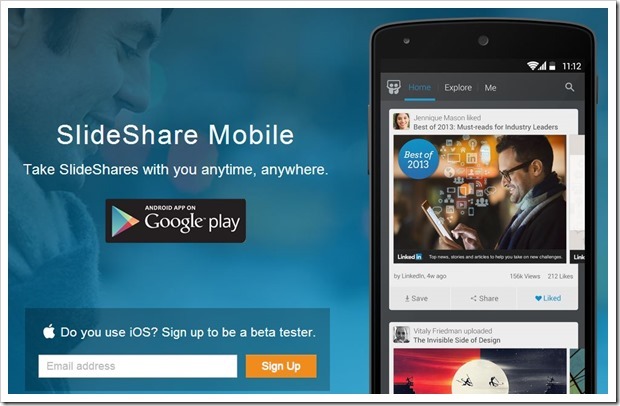 SlideShare Launches Native Android App, iOS Coming Soon! Slideshare, world’s largest platform for viewing and sharing online presentations has finally arrived on mobile. They have launched a native mobile app on Android and is now available on Google play store to download. Prior to this Slideshare site was mobile friendly, but they did not have a native app, which went live on Google play store only yesterday. The iOS native version will soon be launching as well and users can currently sign up to be a beta tester. Talking about the mobile app itself, it does everything that you would expect from it. You can search and view the entire presentations in full screen mode, which we think looks gorgeous on mobile screen. Once the app is installed on the phone, the user first needs to login using Facebook, Linkedin or their existing account on Slideshare. It would have been nice if SlideShare app did not push login process right at the start. They could have initiated login process at a stage where user either wanted to download a presentation or even share it for that matter. But asking for login credentials at the start itself is a little but aggressive. One feature that we really liked is saving presentations for read later or for offline viewing. Essentially the app downloads the presentation on the phone and you can view it even when your mobile phone is not connected to internet. Apart from these, Slideshare mobile app users can follow certain presentation categories, users or companies so they know of new presentations as soon as they are uploaded. Interestingly, the app does not allow upload of presentations from the app (atleast we did not find it) and I think it is for a good reason. Slideshare is a platform for uploading presentations, whitepapers etc and it is quite rare that one would prepare a presentation on their mobile phones. Not too many would miss this feature. Overall, the Slideshare’s mobile app is something you would really want on your mobile phones if you like viewing and sharing presentations.